Samantha Galbraith of the Umatilla Vikings spikes a shot directly into the block of Irrigon's Leslie Coffman during the Tuesday match. 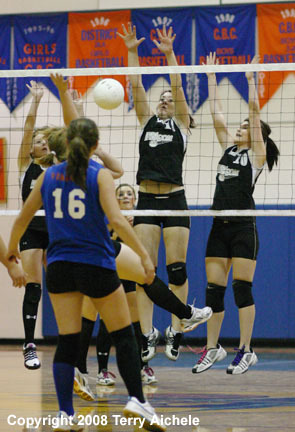 UMATILLA - Umatilla of the 3A Eastern Oregon League hosted the 2A Irrigon Knights of the Blue Mountain League in volleyball action on Tuesday. The five set match took over an hour and a half to play. Irrigon totally dominated the first two games then the momentum flipped and Umatilla dominated the third and fourth games. The 2-2 tie lead to the first to 15 fifth game. Irrigon turned it around, worked hard as a team and showed confidence in their play to win the fifth set to take the match win. The first game started off with Irrigon taking an early lead 4-1. Umatilla battled back to tie it at 6-6 then again at 7-7. Then Staci Stanger took the serve for Irrigon and the Knights went on a five point run to take a 13-7 lead. At the 19-13 point of the game Leslie Coffman took the serve for Irrigon and, with a run of serve including an ace, the Knights took a 24-13 lead. Umatilla took the serve on a sideout but immediately missed a shot giving Irrigon the first game 25-14. Umatilla had first serve at the start of the second set but Irrigon took the sideout and went on a 7-0 run under the steady serving of Beth Reeves. During this early game run Leslie Coffman smashed a huge kill to give the Knights the 4-0 lead. Coffman took over the serving at 12-3 and with an ace and some nice team play the Knights went to an 18-3 lead. Umatilla looked disorganized while Irrigon was hitting perfectly placed shots through the rest of the game. The Irrigon Knights took the second game 25-7. The third game early on looked like it might be another Irrigon win. They took the early lead 6-3. Then Umatilla sophomore Kaitlin Kennedy took the serve and the Vikings from being down 4-6 to taking a 14-6 lead. 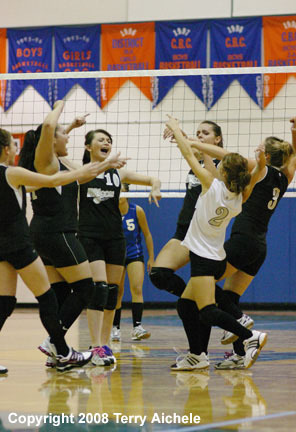 Umatilla showed a poise and control which was missing in the first two games of the match. 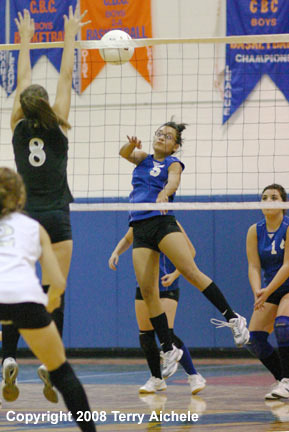 It was Umatilla's turn to show strong play and accurate hitting. Katelynn Schaefer-Cranston opened the fourth set by serving a streak that took Umatilla to a 10-0 lead before a sideout gave the ball over to Irrigon. The serves of Schaefer-Cranston and the play of the rest of the Vikings gave the impression that Irrigon's players were seemingly out of of position or a half-step slow. Then when Leslie Coffman took over serving for Irrigon at 3-12 it seemed like the Knights had reawakened and were able to close to 10-14 before losing the serve. 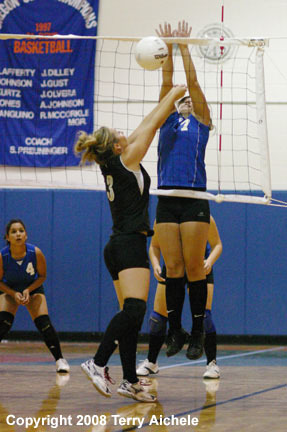 Umatilla steadied themselve and took control of the game pulling away to a 25-15 win. The 2-2 tie meant that there would be a first to fifteen final match. Umatilla had the first serve and to a 3-0 lead. A kill by Coffman of Irrigon gave the Knights the sideout and Jessica Henrichs took the serve for Irrigon as they tied it up 3-3. The teams tied it up at 5-5 and 6-6. Then a kill by Alicia Wiser of Irrigon gave the Knights the sideout. 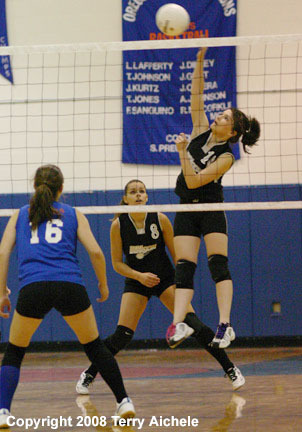 Christina Garcilazo then served the Knights to a 8-6 lead. Umatilla under the serve of BreAnna Watson tied it up 9-9. When Irrigon took the sideout Staci Stanger hit an ace and the Knights ended up with a 12-9 lead. After exchanging sideouts the serve came to Irrigon's Beth Reeves who served out the fifth game 15-10 to take the match win. "We did the hard way, but it's nice to have a win." Jill Wright, Irrigon head coach said after the match. Did she have any doubts that her team could come back? "Game three. We expected to win it on errors instead of earning it. It was a good wakeup call. We'll take it." Irrigon will play in Elgin on Thursday. It's a pink out day for breast cancer awareness at the Elgin High School that day and the Knights will showing their support by wearing pink. 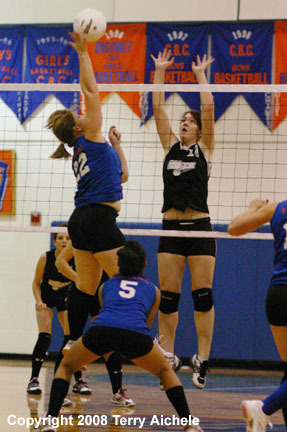 LEFT - Selena Torres of Umatilla, the far court, spikes the ball against Leslie Coffman of Irrigon. RIGHT - Jessica Henrichs of Irrigon, in the near court, bumps a ball while Shannon Aldred worked the net. LEFT - Irrigon head coach Jill Wright talks to her team during a time out early in the match on Tuesday. 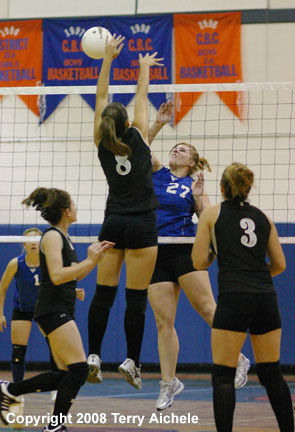 RIGHT - Umatilla's Samantha Galbraith spikes the ball against Samantha Egge of Irrigon. LEFT - Kaitlin Kennedy of Umatilla in the far court, blasts a spike against Irrigon defender Leslie Coffman. RIGHT - Chrissy Tooley of Umatilla bends down low to bump a serve. LEFT - Samantha Galbraith of Umatilla, in the far court, battles Jessica Henrichs of Irrigon, in the near court, during the match in Umatilla on Tuesday. 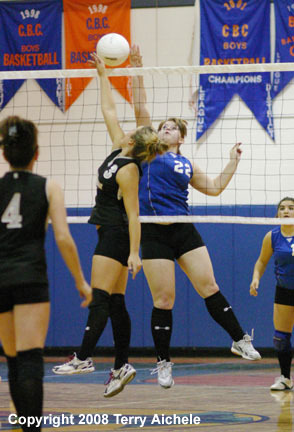 RIGHT - Samantha Egge, left, and Beth Reeves of Irrigon jump at the net in an attempt at an offensive block. LEFT - Irrigon Knights players, Alicia Wiser in black, and behind her, the libero, Staci Stanger get in position to bump a serve. 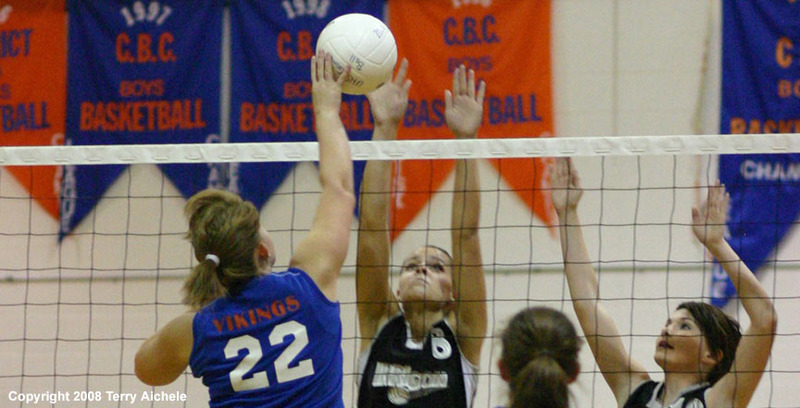 RIGHT - Leslie Coffman of Irrigon, in the far court, blocks a shot by Kaitlin Kennedy of Umatilla. 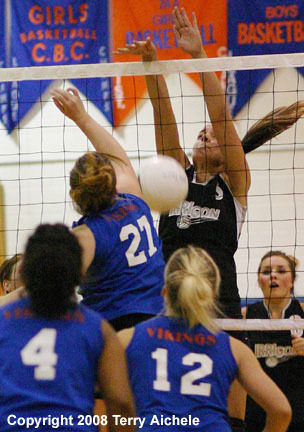 LEFT - Beth Reeves of Irrigon spikes the ball. RIGHT - Irrigon Knights celebrate a point being scored.